Most people cling to their fears, because of comfort and years of allowing them to be a part of them, and run their everyday life. Are you ready to pursue your vision as if fear was not a factor? Do not confuse fear for rushing things with your journey, as everything happens in its own time. However, you must not be afraid to start, take risks, and turn your obstacles into opportunities. Let me share a short story of how I met my fantastic speaker manager Mrs. Donna Buttice, and how connecting with her helped elevate our keynote speaking business to a higher level. I met Donna about 9 months ago, through an introduction by Mrs. Mel Robbins and her fantastic team. After talking with Donna after one call, we both knew we had a great business synergy to work together, and decided she would represent me as my speaker manager. When I met Donna, I thought I had "all my ducks in a row" and was ready to hit the speaking circuit with a bang. After Donna and I decided to work together, we had a strategy call, to get on the same page so we could move forward objectively and professionally. That strategy calls did not go how I expected it to go, to be totally honest with you lol. Donna informed me that I had to "revamp" some things if I was going to play in the "big leagues" as a keynote speaker. I needed to revamp my website, get better videos of me speaking on my website, I needed to do a monthly newsletter, I needed to get more consistent on my social media posting, and more. After we hung up the phone, I was literally in shock. I thought to myself "well damn if I need to do all that why does she want to work with me?" Fear had set into my mind, as I started to doubt my abilities as a keynote speaker because I had so many things I needed to revamp. I did not know Donna very well at that time, and even though I was a little hesitant to take her advice, I decided to myself "Marques, this woman is an extremely well-credentialed professional. You need to trust her implicitly, to elevate your brand to a higher level." So after taking a short time to reflect on what she told me, I dived right in and begun to do what she told me. It took about 90 days for us to revamp everything, and get processes and systems in place to help our brand. As soon as things got organized, our brand took off like a ROCKET! I am so grateful for what Donna did to tell me straight up what I needed to hear, and not what I wanted to hear! So on your journey, if fear enters your mind, I challenge you to stop, take a moment and analyze the situation. 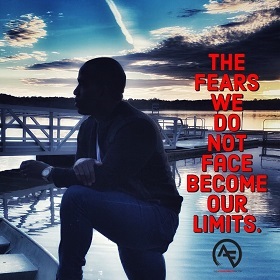 After you have had time to decode the information, make the best choice for you and your brand, and don't let fear hold you back in any way shape or form!!! 2. Break down each fear• "What is that you are terrified about from this fear?" 5. Practice Gratitude • Changing the negative situation into positives. 6. Talk • Finding the Accountability partner who challenges you, however, do not judge you. 7. Take Action• The longer you wait, the more fearful it becomes. 8. Celebrate• Celebrate milestone whether they are small, medium or large milestones. An accomplishment is an accomplishment and does not discredit it. Be Proud. Fear tends to be bound to the emotions so remember to separate the outcome from your feelings at all costs.